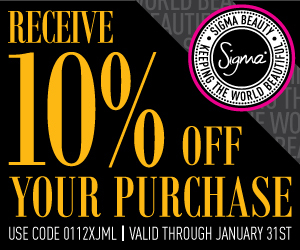 Time for a new monthly Sigma Beauty Coupon code! Enjoy 10% off your order with new coupon code MARCH2012 valid thru March 31st You will also get a free gift if you spend $30 or more! So remember, coupon code MARCH2012 for 10% off your order! do they ever have like 20% off coupons? or more? i just dont feel like spending that much money. the most i could save is six dollars, which isn't a lot.